COM-BAT (Center for Objective Microelectronics and Biomimetic Advanced Technology) has been established with a $10 million grant by the U.S. Army. The intent is to bring an otherwise science-fictional bat-sized robotic spy plane to life. The bat-like MAV (micro air vehicle) would gather data from urban combat zones and transmit the information in real time to soldiers. U-M researchers will focus on the microelectronics. 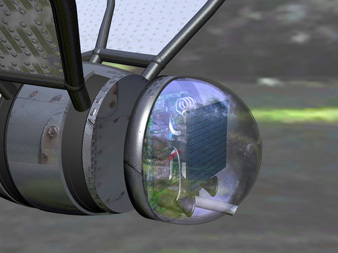 They will develop sensors, communication tools and batteries for this micro-aerial vehicle that's been dubbed "the bat." Engineers envision tiny cameras for stereo vision, an array of mini microphones that could home in on sounds from different directions, and small detectors for nuclear radiation and poisonous gases. The device would utilize a low-power miniaturized radar and navigation system to find its way around at night. Energy scavenging from solar, wind, vibration and other sources would be encouraged. Update 20-Mar-2008. As long as the U.S. Army is procuring, it might as well get the wristband viewer and controller from the same novel. Handy, no? End update. Don't miss UAV Cloud Swift and the Tiny Spyplanes That May Recharge On Power Lines, both of which could teach UM engineers a few things about power scavenging. 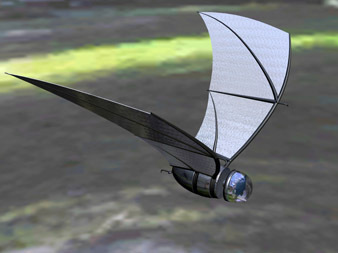 Via Sensors for bat-inspired plane under development.